One of the challenges of integrating ultrasound into a medical curriculum is having access to consistent monitoring and tracking. 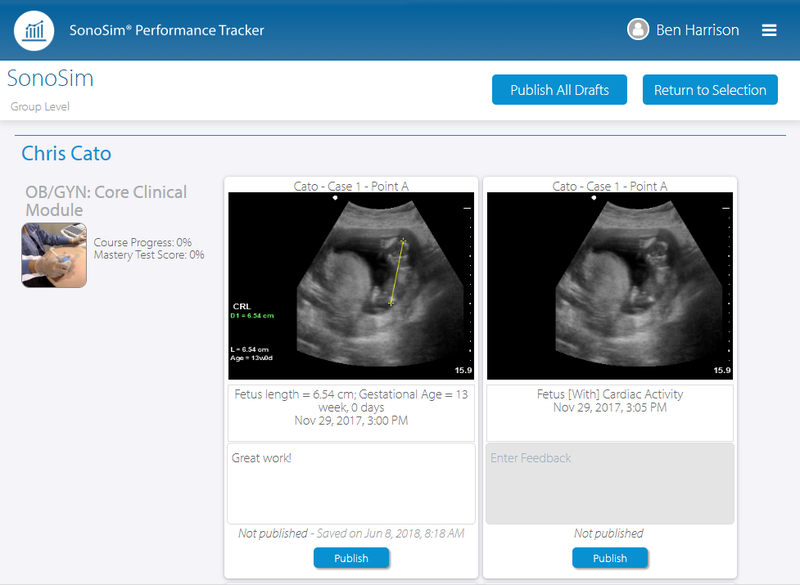 Developed to complement clinical training and remote learning environments (“flipped classrooms”), Performance Tracker provides a cloud-based interface with real-time performance metrics of learner ultrasound training progress. 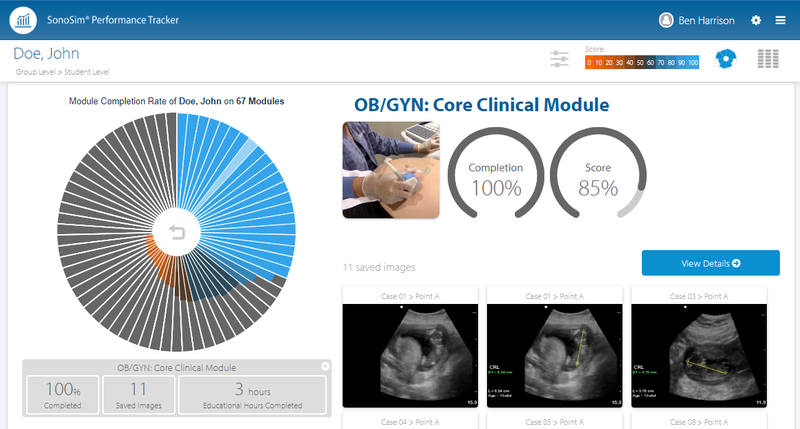 With the release of Module Assignment Feedback, instructors can now provide comments on learners’ saved ultrasound images, such as providing optimal image acquisition and interpretation feedback to learners. Don’t know how to use Assignment Feedback? Review our How-To Guide. Since the launch of Sample Module Assignments, one of our most frequently asked questions has been “How do I know if a resident or student has completed an assignment?” And now, we have a solution: The Assignment Report. The Assignment Report provides a very clear overview of which users have or have not completed each portion of the assignment, giving instructors an easy way to assess and monitor fellow, resident, or student progress. While the default format for generating reports creates an easy-to-read, more visually appealing PDF document, reports can also be exported to an excel format. This is particularly useful for exporting and uploading scores into your institution’s learning management system, such as Blackboard, Canvas, Docebo, etc. 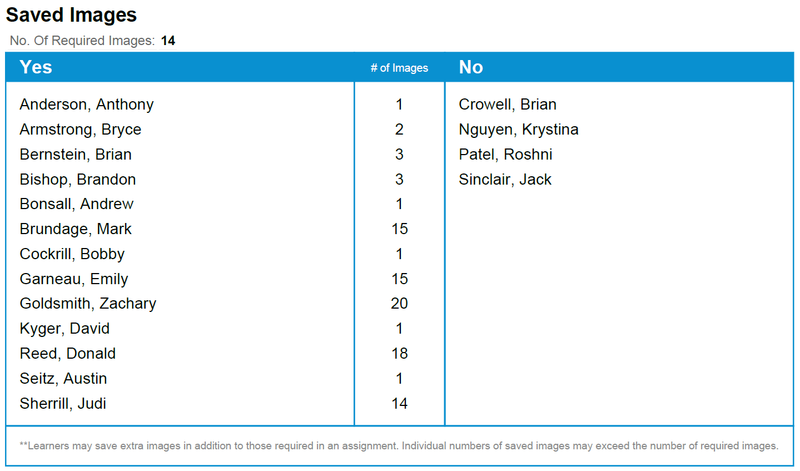 Radial and Table View provide a lot of useful information about the entire group of learners. However, if you are interested in drilling down results to a few modules or a subset of learners, we have a solution: Filter Options. With Filter Options, you can pick and choose which information to display and view only relevant information. Additional Tip: Filter Options persist between sessions. For example, if you filter down to only see our GYN Modules and then log out, the next time you log in and go to a Student Performance View, just the GYN Modules will still be selected. You can restore the default display by clicking “Select All” in the Filter Options. Within Manage Accounts, you can add new users with the Add Student feature. However, to add many new users en masse, you can use Bulk Import within the Add Student feature. With Bulk Import, you can create as many accounts as you have seats available; it’s particularly helpful when one class graduates and you need to create accounts for the incoming group of learners. Subgroups are a great way to break up a larger group into smaller units; it is very useful for when SonoSim is being used by multiple groups of users (e.g., differing medical school classes) within one institution. With Subgroups, instructors can select a unique resident or student population to run a report on (for example, the first-year students) with a single click. Additionally, subgroups can be helpful in the Student Performance views, where instructors can filter out extraneous learner groups to focus in and evaluate progress within a single student group. Have additional questions on Performance Tracker? Please contact support@sonosim.com or your local Territory Manager!